(TOKYO, JAPAN, 13 MAY 2016) As heads of state from the world’s major economies are arriving in Japan for the G7 Summit, world renowned religious leaders from the Middle East convened in Tokyo on 12-13 May to advance the full citizenship of all communities in Muslim majority states. Doing so, they stated, was an irreplaceable key to preventing and transforming violent extremism, Islamophobia and xenophobia. The High-level International Consultation was organized by the United Nations Alliance of Civilizations (UNAOC) and Religions for Peace under the theme: Partnering with Religious Leaders of the Middle East in Advancing the Protection of Minorities in Muslim Majority States. 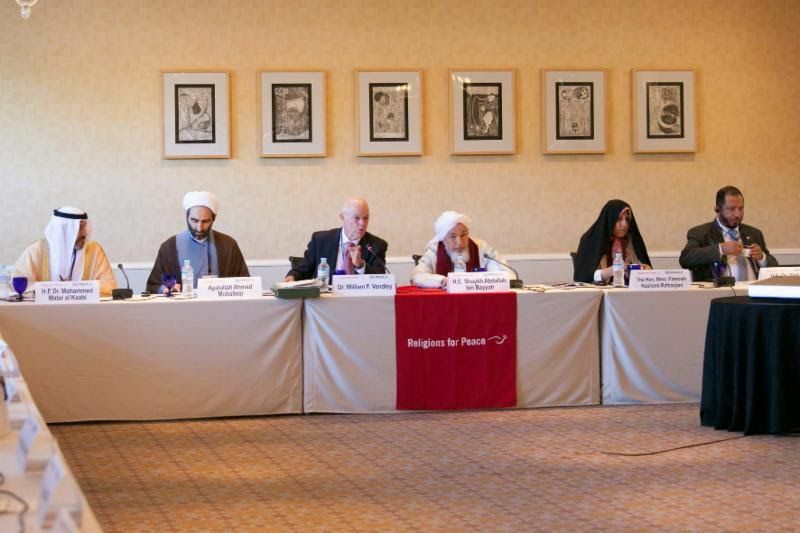 The consultation was hosted by Religions for Peace Japan. Venerable Gijun Sugitani, Chairman of Religions for Peace Japan, stated that hosting the consultation was an expression of solidarity between the religious leaders of Japan and those in the Middle East. The Tokyo consultation brought together more than 60 senior-most Muslim leaders from the Middle East and North Africa and internationally recognized eminent religious leaders from other traditions. The Consultation reaffirmed the recent Marrakesh Declaration that was issued on 27 January 2016 under the auspices of His Majesty King Mohammed VI of Morocco and the leadership of H.E. Shaykh Abdallah Bin Bayyah, President of the Forum for Promoting Peace in Muslim Societies, based in Abu Dhabi, United Arab Emirates. The Marrakesh Declaration was based upon the historic Medina Charter, an Islamic primary source that is precious for all Muslims. It makes clear the Islamic commitment to full citizenship of religiously diverse communities in Muslim majority societies. H.E. Shaykh Abdallah Bin Bayyah noted that the Marrakesh Declaration was an example of the Islamic community turning to its own “pharmacy” to find the “medicine” to heal distorted interpretations of Islam. All the Islamic scholars present agreed on the foundational importance of clearly establishing the original Islamic positive orientation to peaceful pluralistic communities with full citizenship for all as expressed in the Marrakesh Declaration. The representatives of other religious communities gratefully witnessed the Muslim re-affirmation of the Marrakesh Declaration, hailed its importance for building just and harmonious societies, and also committed themselves to using their respective religious traditions in active support of robust notions of inclusive citizenship. Convinced that transforming violent extremism requires cooperation between governments and religious communities, the religious leaders met with Japanese political leaders, including: H.E. Mr. Fumio Kishida, Minister for Foreign Affairs; Mr. Sadakazu Tanigaki, General Secretary, Liberal Democratic Party; and Mr. Katsuya Okada, President, Democratic Party. In addition, they interacted with government representatives from Bosnia and Herzegovina, Egypt, the Holy See, Indonesia, Iran, Iraq, Lebanon, Morocco, Mauritania, Saudi Arabia, Spain, Turkey, United Arab Emirates, and the USA. Initiating concrete cooperative action among their communities to advance inclusive citizenship for all. You will find the programme, including the names of distinguished leaders from among the group here.